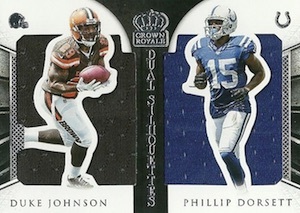 Steeped in tradition and led by die-cut designs and Silhouettes cards, 2015 Panini Crown Royale Football continues its recent hit-per-pack format. Each hobby box includes two autographs and two memorabilia cards. 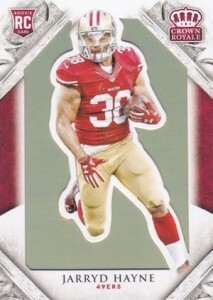 The base set features an updated die-cut design along with several foil parallels, including Gold. A key focus of the product and popular with collectors, RPS Silhouette Signatures feature a die-cut player image with a patch set behind it and on-card signature. 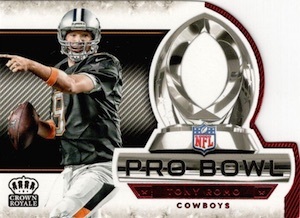 The checklist includes the 41 players at the 2015 Rookie Premiere and the cards are exclusive to Hobby boxes. The base version is numbered to 299 or less and there are also Gold (#/49 or less), Purple (#/25 or less), Green (#/5 or less) and Black (1/1) parallels. 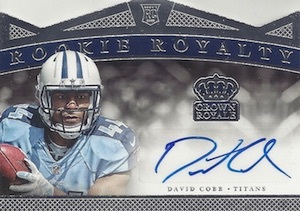 Other signed cards in 2015 Panini Crown Royale Football include Sovereign Sigs and Rookie Royalty Sigs. 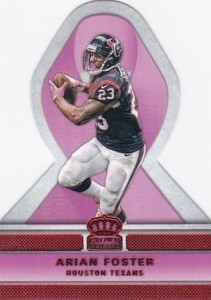 Both utilize sticker autographs, a die-cut design and a print run of 199 or less. 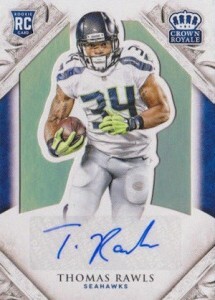 Gold (#/99 or less), Purple (#/25 or less), Green (#/5 or less) and Black (1/1) parallels add to the totals. 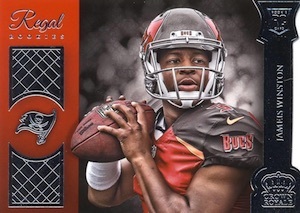 Featuring a large memorabilia piece, Jumbo Silhouettes, numbered to 99 or less, flip the autograph design horizontal and also offer Gold (#/25 or less), Silver (#/10 or less) and NFL Shield (1/1) parallels. 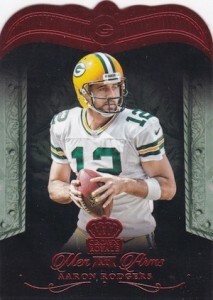 Heirs to the Throne memorabilia cards opt for a trio of players and relics on each card. 41 cards. Serial numbered #/299. No name autos. 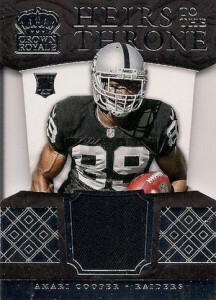 Base rookie cards are also undrafted or not on any roster. For 2 bucks a card to buy these, you’ll never make your money back. I’m done with Panini’s overpriced retail garbage. I should’ve learned from the 119.99 box of Rookie and Stars Longevity. Gets worse. Out of 34 base vet cards, 13 are doubles. Out of 20 base rookie cards, 5 are doubles. Unbelievable Panini. I’m getting tired of this industry. 35 yrs of serious collecting and it ruined me as of late. It’s a cool product. The base are a little weird but they make up for it with their base rookies. 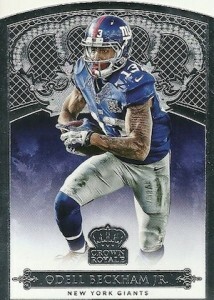 First off, the other Mike bought the Retail Version for Crown Royale Football. Of course your results will be different when you buy retail. There is a reason why the price is 39.95. I am glad to see once again, ONE-HIT PER PACK. 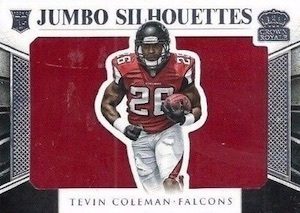 This product has excellent value with Rookie Silhouettes (prime & jumbo prime) and some solid veteran autos to go along with the rookies. Bought both hobby and retail boxes, have been more burned by the hobby pulling garbage hit cards. However, bought retail and while there are no notable autos, have name worthy rookie patches, a /5, two /25s, /30, etc.. lots of low numbered cards. Good stuff. Granted I don’t have 35 years of miserable collecting. Wrong hobby to be in “to make your money back”. Haven’t purchased mine yet, so not rating the product, but just want to comment that I think it’s ridiculous that anyone rates a product based on what they pull in one or two boxes. If you buy 10 cases, then okay, rate it based on what you pull. If you buy 1 box, how could you possibly rate it based on what you pull? 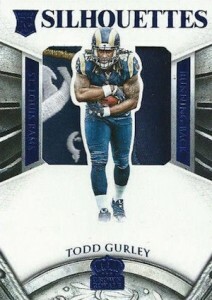 A 1 star product would suddenly be 5-stars if your box happened to have a Gurley auto? You’re giving other collectors bad information. Was a lot of variation to the cards, but no idea what the hit rate is on different parallel cards. The foil on one rookie card had a very noticeable puncture. One match card was very frayed. To make matters worse Two autographs and one patch were all no name people from the Cleveland Browns. I’m not sure if they lumped teams together or not. Great if you get someone decent. Terrible if you don’t. For roughly $100 I’ll go with something like Topps Inception. Not as many cards, but much better quality and almost all are numbered. I liked this product. Too many parallels/subsets though. Good value for the money. 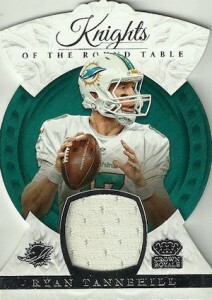 Some of the patch cards and die cuts look really cool. Not really a panini fan,but they usually do pretty good with with this product. 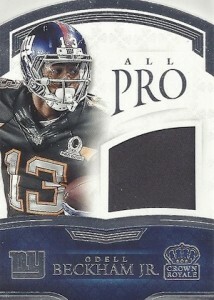 I just opened a box of this and got 2 ONE of ONES in back to back packs! 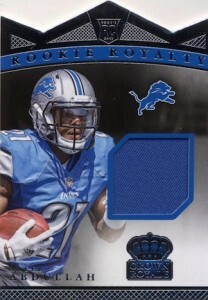 A heirs to the throne triple relic with two nfl logos of bishop sankey and Dorial G.B. and a nike shield of mariota. Then I got a Markus Golden Blue silhouettes auto. 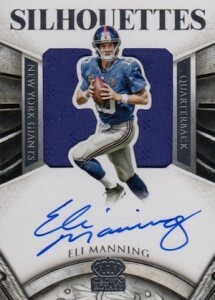 Although, this is very unlikely and some base cards had bend in the corner I loved the product. 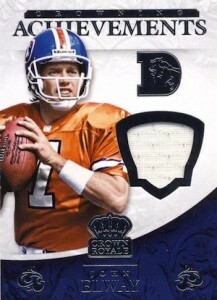 2015 Panini Crown Royale Football Hobby Box - Factory Sealed! 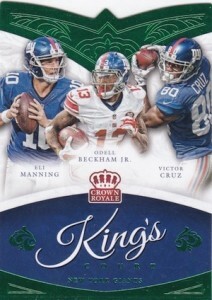 2015 PANINI CROWN ROYALE FOOTBALL HOBBY BOX - 4 HITS PER BOX! 2 AUTOS PER BOX!